ASQ New Haven was lucky to check out Spectrum Associates of Milford with a plant tour. 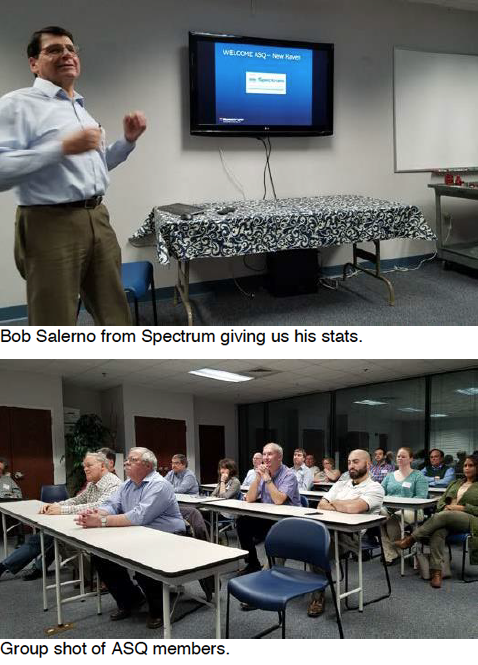 Bob Salerno headed our tour giving us all the specifics about Spectrum. The plant has been in business for over 60 years of producing important valve pressure devices for the Government and commercial Aerospace industries. He talked about how Sikorsky has been a great customer of theirs and making a complex part called the SAS actuator. This device maintains the proper needed stability to help the pilot steer the aircraft. "Having inspected numerous Blackhawks some years ago, we always spend a great deal of time assuring that the SAS actuator worked correctly and was properly installed as it was very instrumental in piloting helicopter flights", said Mr. Salerno. Bob talked about how the business was founded, giving a history of its people and the parts made in the world of pressure valves. He talked about this one-way breakaway valve switch found on an aircraft sponson that would shut down the fuel lines should a plane crash. This is important because if left without a special pressure turn off switch, fuel would often leak out causing a fire potentially killing anyone who may have survived the crash. This part is a most needed device, to say the least. Another part Mr. Salerno talked about was the hydraulic valve that assures all hydraulic systems ran smoothly for navigation, as well as lift and landing concerns. He also talked some more about other processes and how they worked to the latest aerospace standards like AS-9100 Rev D. Spectrum strives to assure all parts meet specifications/standards through process verification audits, while also conducting various design reviews and special process checks to ensure all requirements. We took a tour of the plant where Bob showed us each level of operation and how they designed them to bring about maximum lean manufacturing capabilities. He showed us his receiving inspection area where Spectrum would receive raw materials and a variety sub-assemblies from their approximately 150 suppliers. We then stepped through each Spectrum highly organized assembly and processing area. As aerospace is big on FOD, Spectrum has to assure that all processes and parts are kept FOD free. Overall, we learned a lot about how pressure valves are made with Spectrum's unique designs that surely took some long, hard planning and thinking to get it all done right and on time, every time.